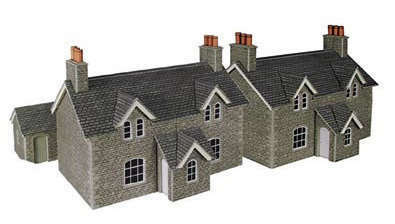 Recommended price £10.00 In this kit you get 2 pairs of semi-detached workers cottages complete with front porch and 4 separate rear out buildings. By trimming the roof end you could turn these cottages into a terrace. Footprint (85mm x 54mm 3 3/8" x 2 1/8") not including porch or outbuilding.